So I got a new book from Packt Publishing to read, I’ve just finished it, and liked it very much. It covers a lot of fun topics like what peripherals can be used with the board, how to configure LAN or Wi-Fi, how to use the on-chip watchdog and the hardware video decoders (I have to admit I didn’t know, that the Broadcom SoC has a built-in hardware watchdog! 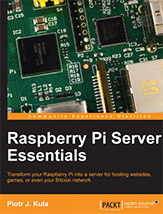 ), how to install and configure a web server, a game server, a file server, how to use Bittorrent Sync and Bitcoin, and how to stream live HD video. I think it’s far the best resource for everyone who already have basic Linux skills and want to get familiar not just with the RPI, but also with any other embedded computer which has a Debian-based OS.